Small Office and Home Office (SOHO) wireless routers have terrible security. That’s nothing new. But it is somewhat sad that manufacturers just keep repurposing the same broken firmware. Case in point: D-Link’s new DIR-890L, which looks like a turtled hexapod. [Craig] looked behind the odd case and grabbed the latest firmware for this device from D-Link’s website. Then he found a serious vulnerability. The usual process was applied to the firmware image. Extract it, run binwalk to find the various contents of the firmware image, and then extract the root filesystem. This contains all the code that runs the router’s various services. The CGI scripts are an obvious place to poke for issues. [Colin] disassembled the single executable that handles all CGI requests and started looking at the code that handles Home Network Administration Protocol (HNAP) requests. The first find was that system commands were being built using HNAP data. The data wasn’t being sanitized, so all that was needed was a way to bypass authentication. This is where D-Link made a major error. They wanted to allow one specific URL to not require authentication. Seems simple, compare string A to string B and ensure they match. But they used the strstr function. This will return true if string A contains string B. Oops. So authentication can be bypassed, telnetd can be started, and voila: a root shell on D-Link’s most pyramid-shaped router. Oh, and you can’t disable HNAP. May we suggest OpenWrt or dd-wrt? 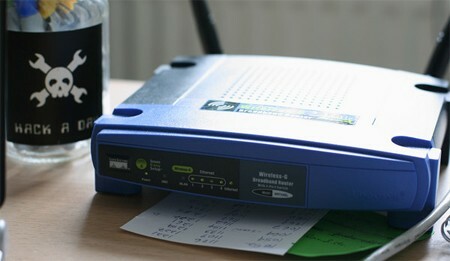 A router with WPS requires a PIN to allow other devices to connect, and this PIN should be unique to every router and not derived from other easily accessible data found on the router. When [Craig] took a look at the firmware of a D-Link DIR-810L 802.11ac router, he found exactly the opposite; the WPS PIN was easily decipherable because it was generated entirely from the router’s MAC address and could be reverse engineered by sniffing WiFi. When [Craig] was taking a look at the disassembled firmware from his router, he noticed a bit of code that accessed the NVRAM used for storing device-specific information like a serial number. This bit of code wasn’t retrieving a WPS pin, but the WAN MAC address instead. Instead of being unique to each device and opaque to every other bit of data on the router, the WPS pin was simply generated (with a bit of math) from the MAC address. This means anyone upstream of the router can easily derive the WPS pin of the router, and essentially gives everyone the keys to the castle of this router. A few years ago, it was discovered the WPS pin was extremely insecure anyway, able to be brute-forced in a matter of minutes. There are patches router manufacturers could apply to detect these brute force attacks, closing that vulnerability. [Craig]’s code, though, demonstrates that a very large number of D-Link routers effectively broadcast their WPS PIN to the world. To make things even worse, the BSSID found in every wireless frame is also derived from the WAN MAC address. [Craig] has literally broken WPS on a huge number of D-Link routers, thanks to a single engineer that decided to generate the WPS PIN from the MAC address. [Craig] has an incomplete list of routers that are confirmed affected on his site, along with a list of confirmed unaffected routers. [Pelaca] upgraded the RAM on his D-Link DIR-320 router from 32MB to 64MB. This hack is simple enough: swap out the existing RAM chip for another one and change the bios to make use of the upgrade. The actual execution is not that simple because of the pitch of the TSOP II package; you’ll need to bring your mad soldering skills to pull this off. This reminds us of when upgrading original Xbox RAM to 128MB was all the rage. It involved the same type of hack, adding four memory chips to unpopulated positions on the motherboard. The forums are thick with people complaining that their box not working after a failed upgrade attempt. Hopefully you’ll have better luck. We reported last week that D-Link was adding captchas to their routers to prevent automated login by malware. Unsurprisingly, it doesn’t work all time. The team from SourceSec grabbed the new firmware and began poking at it. They found that certain pages don’t require the authentication to be passed for access. One of these is WPS activation. WPS lets you do push button WPA configuration. Once activated, any nearby client can request the WPA key using a tool like WPSpy. Only user level credentials are needed to pull this off, so changing just the admin password won’t prevent it. D-Link is adding captcha support to its line of home routers. While default password lists have been abundant for many years, it was only recently that we started seeing the them implemented in malware. Last year, zlob variants started logging into routers and changing their DNS settings. It’s an interesting situation since the people who need the captcha feature are the ones who will never see it, since they won’t log in to change the default password.